Turn your unwanted wargames items into cash! 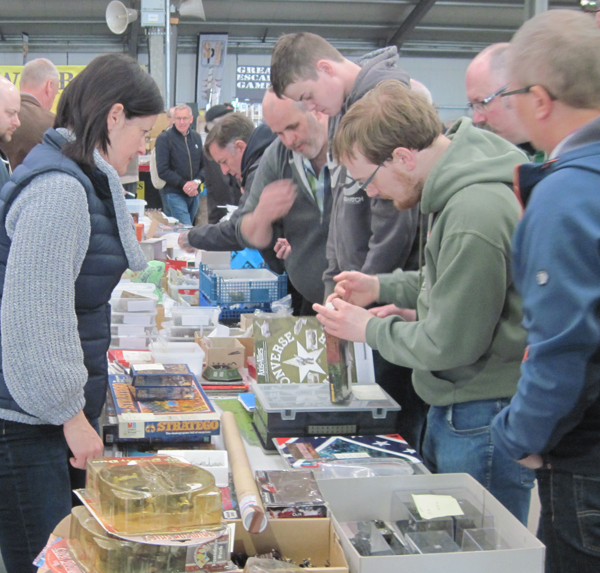 Hammerhead 2019 will be hosting the very popular 'Tabletop Sale' once again in the George Stephenson Hall. If you are new to this, you basically hire a table for one hour to sell your unwanted wargames items. You can deal directly with the buyers and answer any questions they may have. With no commission, you keep all the profits! Please note: there will be limited tables available, it's on a first come first served basis, so book early! Bookings for the Tabletop Sale 2019 slots will be open from 1st February 2019. More details will be published nearer the show date. Please note: There is no facility to store goods. However, the car park is directly outside so your sales items can be stored in your vehicle until required. We cannot take responsibility for left items. 1. There are five sessions which should allow a large number of people to use the Tabletop Sales throughout the day. It is situated in the centre of the hall in the most prominent position available. 3. You will be notified with 5 minutes of the session ending. Tables should be cleared at least 5 minutes before the next session starts. 4. Payment will be on the day. Maximum hire is 2 separate 6ft table sessions during the course of the day. Any slots that have not been taken prior to the event will be available to hire on the day, on a first come first served basis. Please visit the Tabletop Sales Information Desk to check if there are any available slots on the day. 5. We will keep any booked table until five minutes after the session starts, if you do not take up your table by then we may re-allocate it. Empty tables may be offered to those either side, however, if you want to use it, expect to be asked to pay for it. 6. All tables are numbered. When you arrive at Hammerhead visit the information desk in the main hall to receive you table number. 8. Tables are not to be used by Traders, if in doubt check with me or the staff at the information desk. 9. By making a booking, it is understood that you agree to abide with the above conditions.